Prominent Talmudist and methodologist of the eighteenth century; the last of the great rabbinical authorities of Italy; died before 1790. He was dayyan at Leghorn, and apparently lived to an old age. A decision by him, dated Nisan, 1732, and referring to a civil case at Rome, is included in the responsa of Rabbi Isaiah Bassani of Reggio ("Todat Shelamim," No. 11, Venice, 1741). In the controversy between Eybeschütz and Emden he sided with the former (letter of the rabbinate of Leghorn in "Luḥot 'Edut," p. 22). 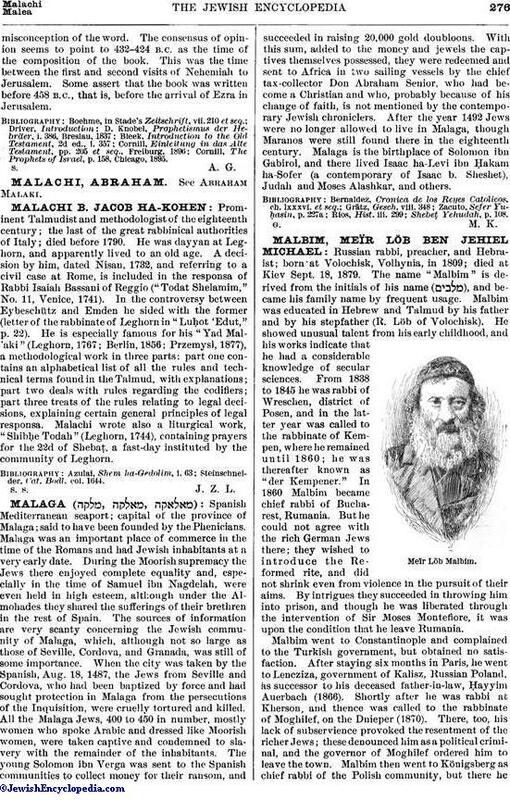 He is especially famous for his "Yad Mal'aki" (Leghorn, 1767; Berlin, 1856; Przemysl, 1877), a methodological work in three parts: part one contains an alphabetical list of all the rules and technical terms found in the Talmud, with explanations; part two deals with rules regarding the codifiers; part three treats of the rules relating to legal decisions, explaining certain general principles of legal responsa. Malachi wrote also a liturgical work, "Shibḥe Todah" (Leghorn, 1744), containing prayers for the 22d of Shebaṭ, a fast-day instituted by the community of Leghorn. Steinschneider, Cat. Bodl. col. 1644.